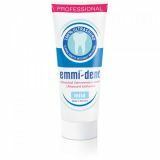 The Emmi-dent is a revolution in oral hygiene. 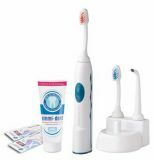 It is the world's first 100% ultrasonic toothbrush that provides safe, motionless, gentle cleaning of teeth and gums. It may look like a normal toothbrush, but it works in a completely different way. The Emmi-dent is made in Germany and is correctly described as an ultrasonic toothbrush because it actually delivers safe ultrasound via the bristles in the brush head at up to 96 Million gentle air oscillations per minute. Compare that to the typical electric toothbrush which does not use ultrasound (even if they are confusingly called `Ultrasonic` or `Sonic`). These products sweep away bacteria from your teeth using a mechanical process, operating at about 30,000 rotations per minute. The Emmi-dent destroys the bacteria cell membrane and kills them, even in those places that a toothbrush cannot get to. They become ex-bacterium! Why delay, get your teeth sparklingly clean, order today! 1 x Charging Station (230v) with UK 3 pin plug adapter.